The market for catamarans is rapidly growing and with it the expectations of luxury boaters. In order to survive the fierce competition, each builder needs to know his competitors and make improvements where they make mistakes. Nautitech Catamarans understands this concept and is consistently gaining attention and praise from multihull cruisers all over the world. The Nautitech 40 is another demonstration of the company’s willingness, please. Just from the outside, the 40 showcases twin steering stations located on each hull’s Sterns and high freeboard bows. In the Atlantic Ocean off the Florida shore, the identical twenty-nine horsepower engines performed with superior catamaran agility while cruising around the marina. Boaters scoping out the Nautitech 40 soon learned not to hold back when applying power to counteract crosswinds hitting the high freeboard which proved to be no match for the two Volvo sail drives. Exiting from the Government Cut, the catamaran was unshaken by wave currents and the wakes of faster, larger vessels. The deck mounted traveler is long and allows the mainsail to be adjusted. From both helms, the mainsheet can be operated with ease. The genoa and mainsail use the same winches. This should be no problem for experienced sailors, but tacking may take time for novices. Once they’ve mastered the stoppers and sheets, the operation will be a breeze. For captains who wish to implement additional handling mechanisms all it takes is doubling up the winches. Then they could add a light air fun sail or a preventer if desired. The boat handling configurations are very seaman-like and simple to get the hang of. The reefing lines and primary halyard are accessed from the mast. All it takes is a simple step up to the roof of the cabin to deploy or put the sail away when ready. No strut or centerline nacelle interrupts the trampolined area in between the bows. For mooring lines and bridles, the crossbeam anchors are there and are equipped with heavy cleats. The living area inside the Nautitech 40 catamaran is large. The saloon is an excellent spot for passengers to spend time conversing and planning out where they’ll visit on their next stop. The galley is relatively limited in size since the four surrounding double cabins take up so much room. Luckily since the gallery is small, the aft bulkhead has a sliding glass window. Where chefs can get a good view of what’s happening in the living area and talk with the others in there. 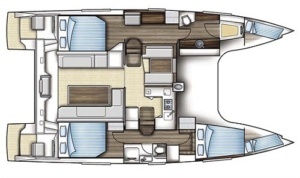 The saloon is designed to feel open and airy, and Catamaran Reviews show that boaters love this design concept. The panoramic windows let in a lot of outdoor light, and the beams are reflected by the white fiberglass. The bedrooms in the hulls are accented by rich wood paneling that feels warm and inviting. By utilizing the bridge deck, the manufacturers have designed sleeping quarters big enough to fit queen sized beds. The charter design has two athwartships berths in both hulls. 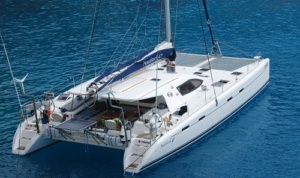 There’s also an owner version which was created for people who want to use the catamaran for more than just quick trips. 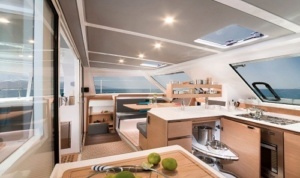 For boaters who want to live in their Nautitech 40, the starboard hull is converted into a private suite. The stern is taken up by a spacious fore and berth, and there are bigger head and master shower in the forward area. In between these areas, there is a desk, settee, and closet space to make life aboard far more feasible. Visitors can still join in on nautical ventures in this version of the catamaran. Two additional passengers can have their sleeping arrangements in the miniature cabins inside of both bows. The LOA of this fantastic catamaran is thirty-nine feet and four inches. It’s LWL measures thirty-seven feet and nine inches. The beam twenty-one feet and four inches long and the draft are three feet eleven inches. The sail area comes out to be nine hundred thirty-six square feet. Its displacement weight is sixteen thousand two hundred eighty pounds. It can hold one hundred fifty-eight gallons of water in its tank. The fuel tank can contain up to seventy-one gallons. The cruising power is supplied by two twenty-nine horsepower Volvo engines. The Nautitech catamaran was designed by Mountain and Mavrikios. Buyers can expect to pay around three hundred seventy-six thousand six hundred dollars for this yacht that is getting so much positive attention in Catamaran Reviews.